The Yakima River is the largest tributary of the Columbia wholly in Washington (The Snake is a larger river, but it only passes through southeastern Washington to its confluence with the Columbia). The Yakima River basin comprises 6,100 square miles in the south-central portion of the state. The basin is bordered on the west by the Cascade Mountains, on the north by the Wenatchee Mountains, on the east by the Columbia, and on the south by the Simcoe Mountains and the Horse Heaven Hills. The Yakima basin supports at least 48 species of anadromous, resident native, and introduced species of fish, as well as more than 250 species of wildlife. Historically, the Yakima was one of the major producers of salmon and steelhead in the Columbia River Basin. It is estimated that before large-scale Euro-American emigration and settlement began around 1850, some 500,000 to 900,000 adult salmon and steelhead returned from the ocean to spawn in the Yakima basin annually. These included spring, summer and fall Chinook, coho, sockeye, and steelhead. Today, summer Chinook, sockeye, and native coho are extinct in the basin (hatchery-bred coho have been introduced). The number of returning adult fish is far below the historic number. In the late 1990s and early 2000s, spring Chinook returns varied from 645 fish to more than 25,000. Fall Chinook returns averaged 2,000 to 4,000 fish, and coho returns were between 1,000 and 2,000 fish. The Yakima Nation is working to rebuild the salmon and steelhead runs through a large-scale hatchery program that produces juvenile fish for release into the wild in an experiment to rebuild naturally spawning runs. Two fish species in the Yakima basin are listed for protection under the Endangered Species Act, bull trout and mid-Columbia steelhead. The population of the Yakima basin was 293,790 in 2000, an increase of nearly 30,000 in 10 years. The largest city is Yakima. By 2020, the population of the basin is expected to be about 425,000. The biggest land owner in the basin is the U.S. government with 1.5 million acres, most of it in national forest and a military training range. The second-biggest land owner is the Yakima Nation, whose reservation covers 1.4 million acres in the southern part of the basin. The entire Yakima basin lies within areas either ceded to the U.S. government by the Yakama tribes in the Treaty of 1855 or reserved by the tribes in the treaty. Nearly 40 percent of the Yakima basin is forested, and another 40 percent is rangeland. Fifteen percent of the basin is cropland. Predominant land uses include grazing (2,900 square miles), timber harvest (2,200 square miles), irrigated agriculture (1,000 square miles), and cities and towns (50 square miles). The climate in most of the basin is dry, with rainfall averaging 10 inches per year with the exception of the highest parts of the mountains on the western edge of the basin. According to a 2004 report on the basin, important crops include apples, hops, grapes, cherries, mint, forage crops, dairy products, and beef cattle, and the basin is one of the nation’s top producers of apples, hops, cherries, and mint. The Bureau of Reclamation owns and operates six reservoirs for irrigation as part of the Yakima Reclamation Project. The total storage capacity is 1.07 million acre-feet. There are three small federal hydroelectric dams in the basin, but otherwise hydropower production is not a major use of water in the basin. 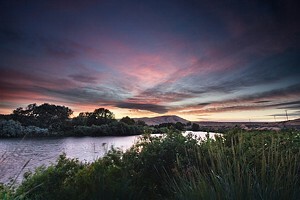 Yakima River at sunset. Credit: Joe Nicora.